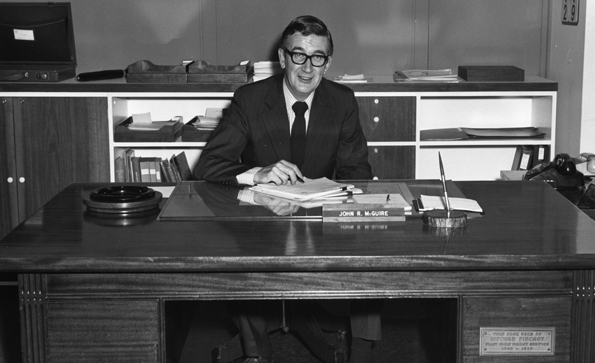 John R. McGuire (1916 - 2002), served as the 10th Chief of the United States Forest Service from 1972 to 1979. John brought real distinction to the Forest Service and to the forestry community during his long career, providing many years of service to his chosen profession. In honor of his significant contributions to the field of forestry and to the U.S. Forest Service in particular, the Forest History Society (FHS) established the John R. McGuire Endowment to enhance FHS efforts to document the history of the U.S. Forest Service. Working with John's wife Marjory McGuire, the Society created the John R. McGuire endowment to assist with the maintenance and development of the U. S. Forest Service History Collection, a vast collection of historical materials relating to the history of the agency that was compiled by agency personnel working in the Washington Office. The Forest History Society manages, catalogs, and cares for the collection, which is housed in the Society's Durham, North Carolina, office. In addition to ensuring the ongoing usefulness of the History Collection, funds from the endowment also support the development and maintenance of interviews related to the U.S. Forest Service produced by the FHS Oral History Program. Marjory McGuire has placed seed money into this endowment with her own gift of $5,000 and a $25,000 bequest in her will. She also donated John’s papers, photos, and books to the Forest History Society. Marjory would be pleased to have those of us who knew John and who appreciate his enormous contributions to forestry join her in this recognition. Please contact Barbara Cushing, FHS Development Associate, for more information. John R. McGuire (1916 - 2002) served as the 10th Chief of the Forest Service from 1972 to 1979. This collection includes three photograph albums that depict various parties and events during the 1970s and 1980s.